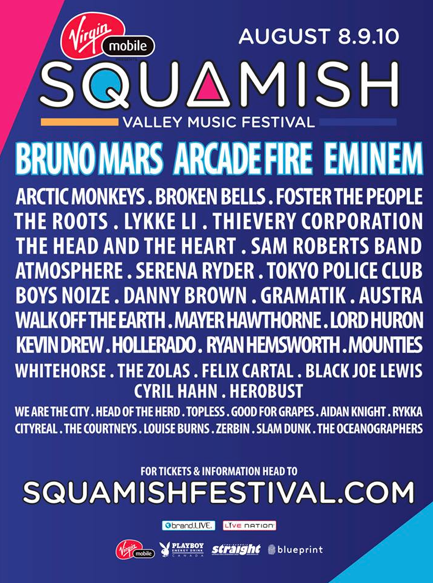 The Squamish Valley Music Festival is playing in the big leagues this year. They announced their headliners yesterday and - BOOM - we're all impressed. Bruno Mars, Eminem and Arcade Fire were announced as the headliners. Other acts include Arctic Monkeys, Broken Bells, Foster the People, The Head and The Heart, Serena Ryder, Walk Off the Earth, We Are The City - and many more. This doesn't meet the BC music festival bar that was set by the Pemberton Festival of 2008 - but it could get there. The Festival takes place August 8-10 and tickets go on general sale on Monday February 3.